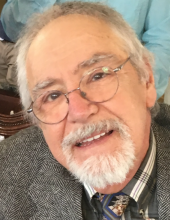 Alfred N. Muoio, 71, of Lemoyne, passed away on Wednesday, May 23, 2018 in Geisinger Holy Spirit Hospital, Camp Hill. He was a carpenter by trade, currently with Fed Ex, Lewisberry and a US Air Force veteran of the Vietnam War. He was a member of St. Theresa Catholic Church, New Cumberland and a member of its folk group for 5:30 Masses; a guitarist for the Life Teen Mass at Church of the Good Shepherd, Camp Hill where he was also a member of the Pilgrims of Praise Prayer Group; a member of the Guardian Knights Motorcycle Club; a licensed HAM Radio operator; and a member of American Legion Post 143, New Cumberland and its American Legion Riders Chapter. Al was born in Brooklyn, NY to the late Vincent and Annette (Maltese) Muoio. He was the widower of Roseanne M. (Bobitz) Muoio and is survived by his daughter Bree M. Muoio of Lemoyne; sisters, Ann Careccia and husband Joseph of Sebastian, FL and Connie D. Mirando and husband James of New Cumberland; and several nieces and nephews. Mass of Christian Burial will be celebrated at 10:30 am Saturday, May 26, 2018 in St. Theresa Catholic Church, 1300 Bridge St. New Cumberland, PA 17070 with the Rev. J. Michael McFadden, his Pastor as Celebrant. There will be no viewing or visitation. Burial will be in Emanuel Cemetery, Lewisberry. In lieu of flowers, the family respectfully requests memorial contributions in Al’s memory to St. Theresa Catholic Church at the address above. To send messages of condolence to his family or for driving directions, please visit www.Parthemore.com . To send flowers or a remembrance gift to the family of Alfred N. Muoio, please visit our Tribute Store. "Email Address" would like to share the life celebration of Alfred N. Muoio. Click on the "link" to go to share a favorite memory or leave a condolence message for the family.